Holographic film are designed and produced to impress customers with striking brightness,vivid colors,kinetic patterns,and great performance under printing and lamination.The most commonly used holographic films are PET,BOPP,Depending on your applications,you may choose the film tye that best suits your needs. Pink, dark pink, silver, transparent..
1) Binhao Group is a professional packaging enterprise who is committed offer the superior packaging design, packaging material and printing program to tobacco industry. Main products included hand rolling paper, cigarette packaging, base paper, molasses packaging. 2) We try our best to achieve technical innovation and diversification of trading all the time, and integrate preponderant factory resource of the domestic and overseas constantly. We have strong technology strength and manufacturing facility, including German Monralan series printing machine group,. Swiss Buster high precision automatic die cutting machine, holographic anti-counterfeiting hot stamping machine, production line of wheel. 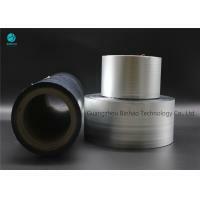 Manufacturing facility of PVC heat-seal film and twisted film use advanced extrusion technology and testing system. 3) We win the praise and trust of our customers by excellent quality, strict management, deep technical foundation and exclusive special service, our products had been covered North America, South America, Africa, Russia, Vietnam, Laos, North Korea, Singapore and more that 30 countries and area.